Are you the kind of couples who love manicured lawns and gorgeous green details? Are you looking for plush green wedding lawns in Kolkata to host your one-of-a-kind grand wedding celebration? Surprisingly, Kolkata couples don’t need to travel too far to have a stunning garden style wedding. From expansive gardens to far-fetched greenery, these Kolkata has the best of the best wedding hotels featuring spacious banqueting facilities and open-air venues that will stun you! Their facilities coupled with in-house services, ensure your wedding festivities receive unmatched attention to detail and is an all-in-all an unforgettable experience. Providing a wide open air space for your big fat Indian wedding celebration, JMS Villa & Garden is one of the best wedding lawns in Kolkata. The venue offers an entire lavish air-conditioned Villa combined with the lawn space to accommodate a large gathering. Perfect for both pre-wedding and wedding festivities, this venue has in-house decorators who can help you set the right ambiance for your wedding celebration. The venue does not provide catering services, thus allow you to book your own caterer, as well as make your own entertainment arrangements. One of the most lavish wedding venues in Kolkata, Club Verde Vista has multiple aesthetically designed marriage venues to offer. Along with their 2 stunning banquet halls, Club Verde Vista has a rooftop venue featuring a fountain and a garden making it an ultimate choice for your outdoor celebrations. The venue has in-house caterers and decorators looking after the major component of your functions by providing finest services. The venue allows you to book your own DJ and make your own liquor arrangements. P.C. Chandra Garden is one of the most sought after wedding lawns in Kolkata known for offering lush green island of tranquillity, where the city of joy celebrate its joyous occasions in true style. The sheer splendour and richness its expansive lawns and a banquet hall have to offer is breathtaking. This one-stop wedding destination offers all wedding related services in-house, including delicious multi-cuisine meals, spectacular decor and foot-tapping music, but does not restrict you from making your own arrangements. Outside vendors, as well as alcohol are permitted on the premises. With multiple venues on offer you will indeed be spoilt for choice. Spread across an area of 2 lakh sq. ft. with 6000 sq. ft. on water platform, The Calcutta Boating Hotel Resorts offers affordable luxurious wedding lawns for grand weddings, sangeet, corporate and live events. Celebrate your wedding functions in banquet halls with lawn in the open air by the lake side. The venue has their own team of talented decorators taking your celebration to new height with their majestic décor services. The venue allows you to book your own caterer, DJ and make liquor arrangements or avail their in-house services. Taj Bengal is a landmark of 5 star hotels in Kolkata, offering elegant banqueting spaces to host grand wedding functions. Taj Bengal provides one of the most beautiful wedding lawns in Kolkata that can be booked as a sole entity or combined with its banquet hall should you need to accommodate a large gathering. The venue is a one stop shop for all your wedding requirements and provides excellent catering services, music, as well as alcohol arrangements. The venue allows you to book your own decorator or avail their in-house services. Novotel Kolkata, New Town Action Area-1, Kolkata is a great venue for hosting or planning your pre-wedding and wedding function. It has multiple party areas allowing you to have different functions at the same venue. The venue has a lush green lawn which can accommodate a huge crowd and is ideal for an open-air reception. It serves a wide range of delicacies to choose from in both vegetarian and non-vegetarian food to their guests. The decor team takes care of the decoration for your big day. The venue serves alcohol to add to the excitement level of your guests. It offers ample car parking space and valet parking space to their guests for their convenience. Novotel Kolkata, New Town Action Area-1, Kolkata offers complimentary changing rooms for the bride and the groom on their special day. 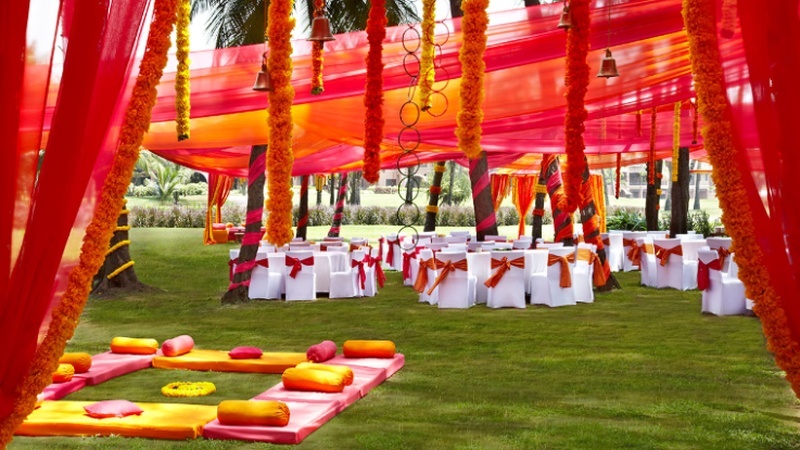 Check out a complete list of many more amazing wedding lawns in Kolkata here.